Rain water collection is used to harvest water for showering and general hygiene purposes. The roof and four awnings collect rain water. A gravity fed gutter system moves the water from the gutters to water storage pillow below the house. A small pump pushes the water through a 4-stage filtration system and into a pressurized intermediary tank near the roof of the house. This intermediary tank feeds into a hot tank heated by a solar energy. Pipes coming from the cold and hot water tank unite in a water mixer that connects to the shower head. Rain water in the house is primarily used for showering, brushing teeth, shaving, and hand washing. The daily usage is estimated at the lower end of national averages, assuming that an individual deciding to live in a tiny house will be interested in conserving resources. Showering usage is lowered significantly due to the low flow shower head. Rain data from the past five years in Chicago, roof size, and usage determined the water tank size and awning size needed. The roof has to collect enough water to sustain about 7 gallons a day to fulfill the user’s desired usage. Since, rainfall does not occur daily, a water tank needs to hold water from heavy rainfalls to provide water for dry spells. A 400 gallon water tank removes the possibility of days with no water. However, to maintain enough water in the tank for usage, the rain water collection catchment area of the home is increased from 128 square feet to 320 square feet. Awnings attached to the roof on all sides provide an additional 200 square feet of horizontal rain water collection area. See figure for sizing of all awnings. The awnings are made from a high grade, darkened vinyl that does not degrade from UV light and promotes snow melt. Aluminum lightweight and rigid frames extend from the sides of the house to support the awning. As pictured here, the awning on the south side allows light to enter in the winter, reaching the back wall during the winter solstice. The light does not enter the house during the summer, keeping it cool. The vinyl awnings can be taken down during travel to fit the highway criteria. The steel frame can disassemble and store in the home for travel. Awning sketch showing Sun angles during different seasons of the year. A gutter feed system transports collected roof and awning water through a pre-filter, removing organic debris, and into the water pillow. The pre-filter sits slightly above the gutter line, allowing for natural water flow, but removing leaves, twigs, plant debris. The pre-filter is made of 50% recycled material and has no chemical leaching. The gutters are stationed on the outside of all four awnings at varying heights; all the water feeds into a downspout gutter on the southeast corner of the home via gravity. The gutters are made from lightweight aluminum material and can be easily disassembled during travel. The water is stored in a flexible water tank, called a water pillow. The pillow is custom-made to fit under the trailer and in between the wheels. The pillow and all accessories are placed in an insulated box to prevent freezing and damage to pumps and pipes. The pillow will be approximately 7'x14'x1' and hold up to 400 gallons of water, providing enough water to last through dry seasons. During travel, the pillow is drained and taken out. The pillow is disconnected from the pipes and folded up for travel. Water is pumped from the water pillow, through the filters, and into an intermediary tank above the shower head. A pump delivers water at 2GPM, significantly higher than the 0.5225GPM needed for the shower head. As the water flows through the filters and up the pipes, the flow decreases. The pump also needs to deliver at least 25 psi to successful elevate the water to the intermediate tank, provide enough pressure to activate the on-demand water heater, and supply good pressure for the shower head . 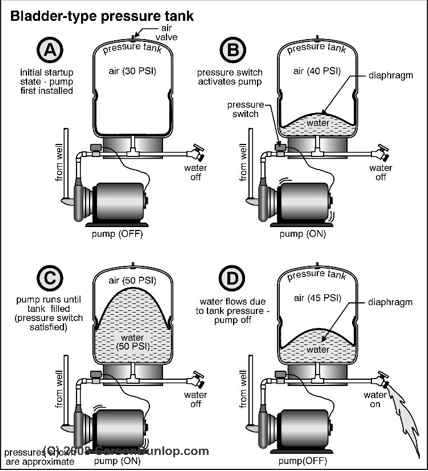 A four-stage filtration process cleans the rain water. The system includes a sediment pre-filter, granular activated carbon pre-filter, carbon block pre-filter, and a UV light disinfection chamber. The filters successfully remove organic debris, contaminants, impurities, and disinfect the water. Additional chlorination can be used for improved scent and residual effects of reducing pathogenic microorganisms. The filter system is 2' x 2' x 6" and is stored in the interior of the home above the pump. The UV light requires 16 watts (depending on flow). The water from the pump enters an intermediate pressurized tank. The tank holds 10 gallons of cold water with a 4 gallon drawdown. The pump only turns on when the water is below the drawdown value. Without the tank, the pump would be activated every time the faucet turns on, decreasing its lifespan. The pressurized tank also maintains a constant pressure and does not allow large and dangerous spikes in water pressure. The pressure in the intermediate tank is controlled by a pressure gauge and can be set to push water from the cold water tank to the lower pressure hot water tank. As shown in the picture, water is kept in a bladder and air pressure pushes on the bladder from the top. The pipe from the cold to hot water tank is curved to allow cold water to enter at the top of the tank and already active solar heated water to enter into the mixer. 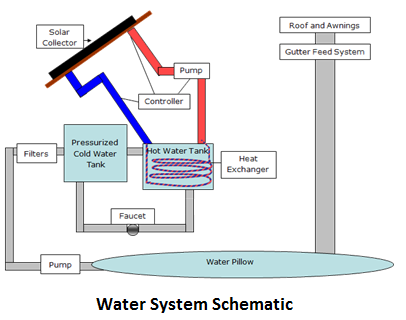 An active solar water heater uses a glycol fed heat exchanger and small pump to heat the water in a 20 gallon insulated tank. This water is fed into the on demand water heater. The cold water pressure tank and water from the on-demand water heater feed into a shower mixer. The mixer maintains a constant temperature (set by the user) by using a pressure sensor to ensure an equal mixing of the different water lines. This water feeds into the Bricor 110 Ultramax showerhead, which uses a 0.5225gpm flow. A non-electric composting toilet reduces water consumption in our home. The toilet holds waste in a chamber below the toilet seat, allowing the feces to biodegrade into humus. A ventilation vent and fan move air away from the chamber to help composting and remove odors. Urine is collected through a separate pipe and sent out of the home.